Are things always as scary as they seem? Once again, picture book author, Steve Antony has blown us away! This time he tells a cautionary tale with a monster twist! Whatever training session I am delivering, I find that my obsession with high quality picture books creeps in. Whether the focus is guided reading or whole class reading; modeling the process of writing; teaching the NC appendix for grammar, punctuation & spelling; drama; moderating writing or subject leader training, there is always an opportunity to share some of the latest released books. So you can only imagine my excitement when I saw ‘Monster in the Hood’ was actually on the shelves at Madeleine Lindley. After reading the book, it was really obvious that this text had the potential (like all amazing picture books) to be used with EYFS, KS1 and KS2. I have suggested a specific year group to use the following activities with, but as always, they are interchangeable. The language in this book will challenge some year 1 and 2 children. However, this is a wonderful resource for encouraging skimming and scanning skills. Teachers can choose a page and ask children to ‘find and point to a word’. This style of guided reading allows children to train their eyes when racing to find the word. Year 2 children are expected to read and spell contractions, understand the function of the apostrophe and explain what the expanded forms of contractions are. Teachers can use the examples of won’t and didn’t to introduce the idea of what a contraction is. The intrepid trio is Sammy Squirrel, Henri Hedgehog and Marvin Mouse. Children can deduce so much about these characters from the illustrations. Each character is drawn in black and white and customised with a coloured accessory – Sammy wears a red bandana scarf, Henri wears a pink baseball cap (back to front) and Marvin wears a gold medal. Why does Steve Antony choose these accessories? Is there a story behind how each character got their bandana scarf/hat/medal? What does it tell us about the characters. When the rats, bats and cats are introduced in the book, they are all wearing either an orange or yellow accessory ( bandana scarf or hats). Why has Steve Antony chosen to do this? What do the colours yellow and orange represent? Is there another story waiting to be told? Isn’t it strange that the same two colours are used for all three animals? Do not show the children the book before this activity. Give the children a selection of words from the book (scare, pack of rats, large orange eye, intrepid trio, squeak, screech, cloud of bats, squeal, clutter of cats, dinner) on individual cards and in small groups ask children to piece together a plot with characters. This is a great activity to assess children’s ability to organise their ideas in a coherent and cohesive way. Teachers may choose to complete some of the following writing activities with children. Retell with a twist Children could create their own characters and retell the story. Children could substitute the rats/bats/cats with their own choice of animal. What are the individual stories for Sammy, Henri and Marvin? Why do they wear a bandana scarf/ baseball cap/ gold medal? What is the story of the orange and yellow bandana scarves and hats? Why do the rats, bats and cats wear them? What happens next with Monster, Sammy, Henri and Marvin? Do they have adventures? What might the sequel be called? Children can focus on appearance, behavior and personalities. Create a fact file for each character. Who do they live with? What is their favourite food? What games do they play? Children could adapt a journalistic style to create a newspaper report for the day the monster came. Focus on the headline, sequencing events (rats, bats, cats), quotations from characters and pictures to illustrate the event. Children could write 3 short diary entries from the point of view of the monster throughout the story – at the beginning (lonely and wanting a friend) middle (sorry that the other animals are scared of his orange eye) and end (happy that he has friends). Teachers could give children the choice of who to write as – rats, bats, cats, Sammy, Henri, Marvin or somebody else? At the end of the book, the characters go to an ‘All you can eat’ restaurant where there is a visual menu (burgers, chips, pizza, drinks, ice-cream, eggs, apples, hot-dogs, muffins, bananas, cheese and soup). Teachers could collect menus as an example to encourage children to use expanded noun phrases. Children could create an expanded noun phrase to match each item on the visual menu. Children could select from the above or design their own instructions. ‘Come out, come out. Wherever you are! You won’t scare us! 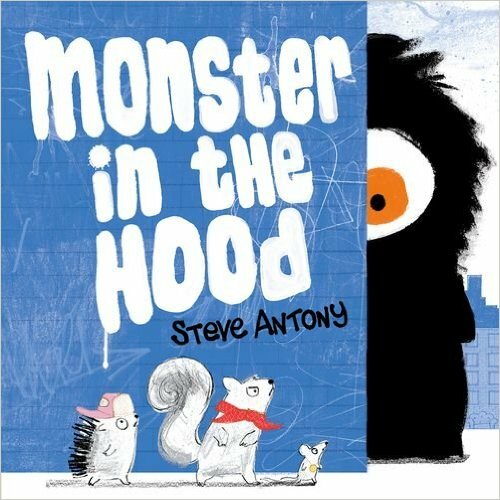 Monster in the Hood is newly published and arrived in the Book Centre just this month. You can purchase your copy from our website here or pop into see us. This entry was posted in Maddy Barnes and tagged maddy barnes, Monster in the Hood, Moon maddy, Teachers. Bookmark the permalink.